Yoga is designed for children in grades K-5. Yoga instructors use a variety of teaching methods and activities, such as poses, meditations, drawings, music, books, sing a longs, stories, and games to develop focus, flexibility, strength, and calmness. Session after session yoga is a continual promotion of doing your personal best, without competition. Children do yoga activities individually, in pairs, and as a group. 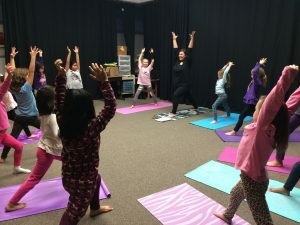 Yoga Kid instructors may be certified through one of many Yoga organizations and receive further training by NOVA Kids in Motion certified Yoga Kids instructors.